The top picture is a (lightened) teaser from Mini. The bottom is last year's "concept". As you can see, the production version is pretty close. Which is good. This might turn out to be the most practical Mini of all. Since it now will have 4 doors. 4 normal size doors. The new "4 door Mini" has such tiny rear doors they seem almost unusable. And it looks really weird in person. This is longer, roomier and the back isn't too slanted forward. It is also not trying to be an SUV like the Paceman. Sign me up. 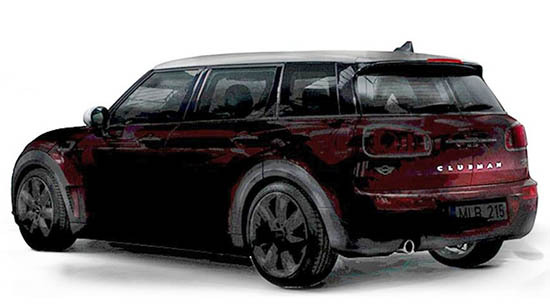 This will be the coolest, most practical and (yes) most popular Mini yet. 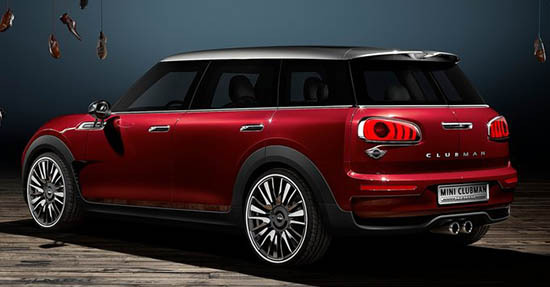 Sure, it's larger than any previous Mini... but it has lots of coolness that makes it very appealing. Really liking that it's a small wagon that isn't trying to be one of the new "Cute-Utes!" (i.e., like the Honda HR-V or the Mazda CX-3, Chevy Trax, etc). I love Mini's but their reliability issues still persist. This new model should have come along awhile ago...if they could improve their quality I'd buy this in a flash. Think it is great...especially the new tail lights.